As our brands have different ways of labelling their clothing sizes, we have listed everything on the site in standard UK sizes, so choose your UK size when adding an item to the basket. If you are unsure of your size, please refer to the tables below. Please note we have allowed a 2cm margin either way. 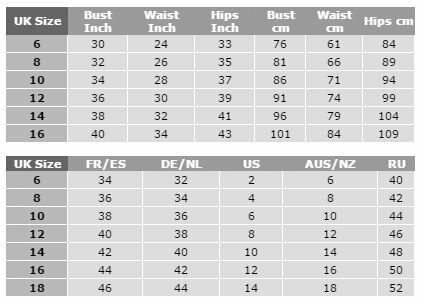 Where possible we have written in the description how the product fits, for example tight, skinny or loose fit. If you do not see the size in the size drop down menu, then we do not have it in stock. Most products that we sell are seasonal and once they are sold out, we might not be able to stock them again in the future. However, some brands re produce their most popular products and our customer service team will be able to tell you whether a product will be coming back into stock next season or not. If you need to ask a question about characteristics or stock of a product or you are not clear on what size you should order, please contact us with the product details.